So I’ve mentioned before, my love for pavers. But did I mention my obsession with pavers and grass? Soil Retention offers plantable concrete systems that look like traditional pavers and are simply beautiful. Fortunately, I’m reading and seeing more large scale projects: arena parking, hotel emergency and service vehicle access areas, and various commercial projects. But what about for homeowners? Soil Retention’s Drivable Grass system is designed for homeowners to install. Their site offers do it yourself installation instructions, as well as specifications for homeowners. The installation instructions will help you with your project, depending on your soil type and vehicle weight that will be using the area. You can even print an installation brochure from their site. 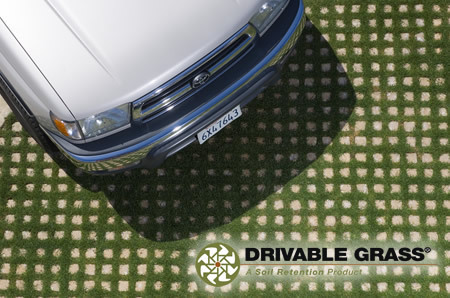 Drivable Grass is made from concrete mats that are flexible and will conform to your terrain without breaking. Pores and cracks in the pre-manufactured grids will allow root penetration to the soil beneath, anchoring the plant material of your choosing. These pores also allow rain and water run-off to permeate the mat, watering your plant material and minimizing off-site water flow. As previously mentioned on Get With Green, allowing seepage through the soil will prevent unnecessary run off to sewers and drains. Oil and other chemicals on our driveways can be broken down naturally by bacteria in the soil before reaching our water table. Keeping our groundwater clean is important for the root systems of our trees. 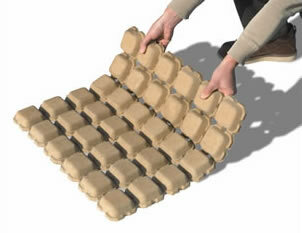 Using products like Drivable Grass, will reduce the affects of flash flooding, and lessen the urban heat-island effect. Runoff can cause erosion to the land and your landscape over time. Even when the Drivable Grass mat becomes saturated, it will still carry the desired load and prevent wheel ruts. For frequently asked questions and complete product specifications and drawings, click here. Check out the online photo gallery of Drivable Grass projects. To find a dealer near you, click here. Have you seen greener driveways and parking? If so, do you like them, and what products have you seen used? So fun, That would be so beautiful. I, too, love pavers and grass. I also like gravel in garden walkways. I LOVE the sound it makes when you crunch it under your shoes!